It`s not surprising polymer clay is popular with the artistic crowd especially those with a talent for sculpting. Designs can really wow with this material. 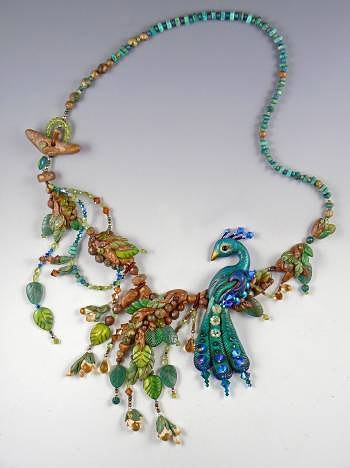 One amazing tutorial for a polymer clay peacock necklace is by Christi Friesen over on Fire Mountain Gems. Her complex Peacock Pizzazz design appeared on the cover of their catalogue some years ago. The necklace is basically strung together once the various components were completed. There are many steps. I noticed she used armature wire to support the largest piece. She also pre-attached crimped beading wire to the clay so she could add beaded strands later. I also loved how she used bugle beads for the bird`s crest! Christi is an amazing artist and teacher!! Did I tell you I took a week long course with her one summer here in Alberta? I learned so much from her! Her teaching is all about having fun and learning at the same time. What a great week that was! Wow! You were indeed lucky to be able to learn from her! Stunning - there's no more to say!